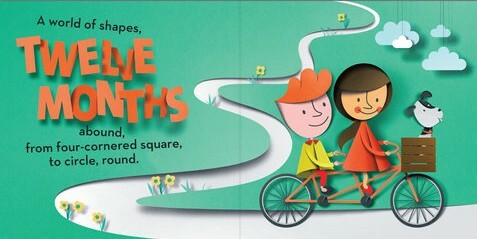 Months and shapes are paired together in Susan B. Katz’s “All Year Round.” Her text is paired with debut illustrator Eiko Ojala’s charming cut-paper artwork. The simple text and colorful illustrations work in harmony. For example: January’s text, “Circle round, ready to roll. Add two sticks, a carrot and coal” is accompanied by an image of two children and a puppy building a snowman. I currently live in a world of numbers, letters, colors and shapes. My almost-2-year-old is obsessed. We must say letters, count objects, assign colors and point out shapes. Every time we pass a road sign, I hear the word “shape” from the backseat of our car. Upon further questioning, said 2-year-old will either say the shape’s name or tell me “no” until I recite the correct one. I feel like this “All Year Round” was made for her. 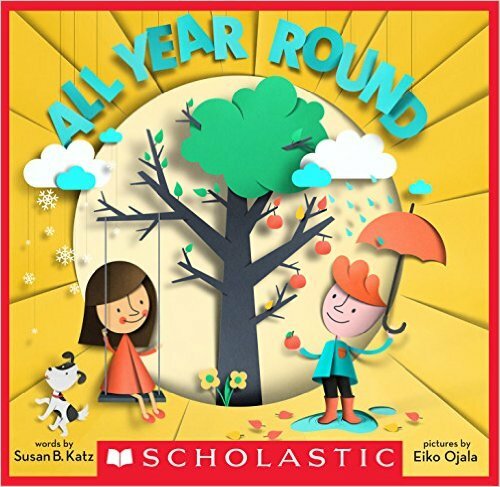 “All Year Round” offers a strong reinforcement of shapes while discovering seasons, too. Each page has numerous items to point out and discuss. Bold colors and cute characters make each page turn a delight. While the publisher’s suggested age range is 4-6, I’d definitely go younger with this one. It’s simple and fun and is the perfect way to pique interest if it’s not already there. © 2016 – 2017, Cracking the Cover. All rights reserved.